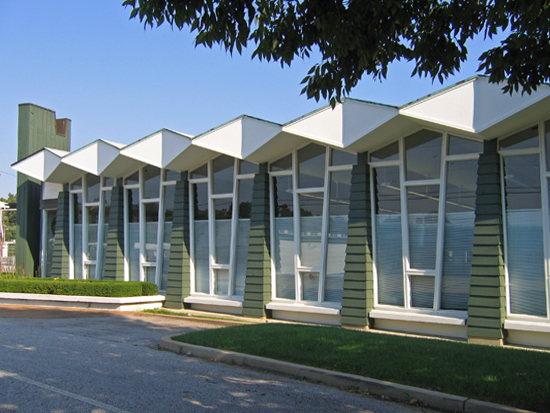 On Watson Road at Sturdy Dr. – between Sappington and Lindbergh – is this crazy pair of mirrored buildings (Dental Centers North & South) from 1974. They’re festooned with every 1960s commercial architecture trick – even lava rocks! – as if they picked up all the litter after the mid-century party was over and fashioned it into a house dress. One day I got curious about the neighborhood behind these wacky buildings, so headed down Sturdy Drive and landed in a small subdivision dotted with houses like the one above. Crestwood Hills lays out in, roughly, the shape of a pitchfork, with the spikes ending at East Watson Rd (aka, Hwy 66), encompassing only 6 short streets. 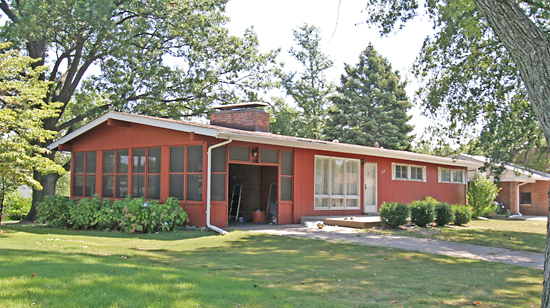 County property records show that all of them were built between 1955 – 1957, but the wide and unending variety of styles gives it the look of unfolding over a longer period of time. It’s apparent that a goodly number of the homes still house the people who originally bought them in the mid-50s. 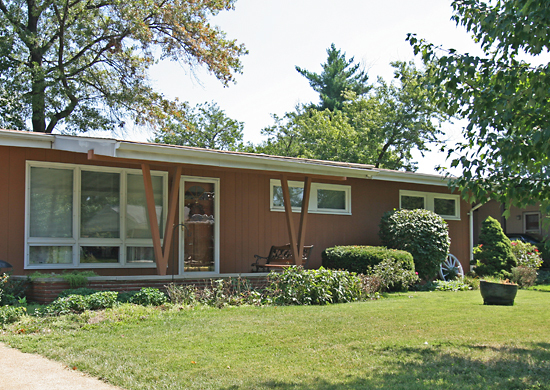 Then there’s an encouraging handful of homes (like the one above) that have been bought in the last few years by younger generations who know what they have, were happy to get it for under $175,000 in desirable Crestwood, and are lovingly reviving its mid-century modern ranch beauty. Drive through this neighborhood and you’ll get whiplash from trying to take in all the different types of homes. So it’s better for your neck if you walk it, but there are no sidewalks. 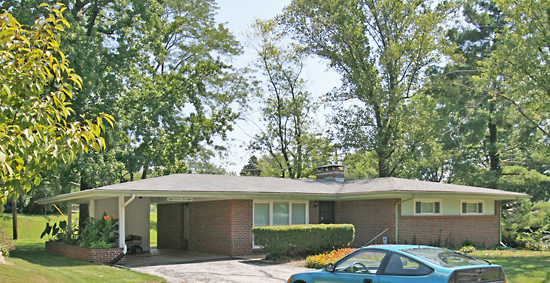 That’s one hallmark of a classic mid-century suburban neighborhood – they more often than not did away with sidewalks. Was that a budgetary decision? Or was the love affair with how the automobile could transform every fiber of daily life raging so hard that they imagined no one would need never walk again? But I do love how the automobile figured into the layout of these homes. 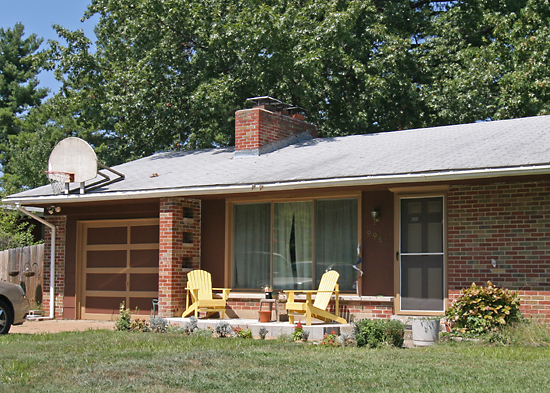 Even a fairly typical traditional ranch home like this got the carport. And it’s not just a place to park the car, but also sports a utility shed under the sloping roof and a flower planter, with both anchoring the open end of the house. I also love how this carport lends transparency, as you’re able to peer straight into the backyard. 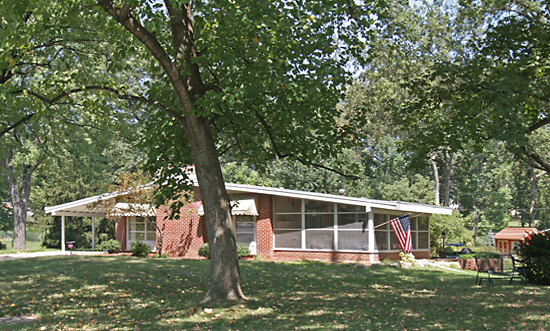 And in the spirit of no two Crestwood Hills houses being exactly the same, the developers used the same basic floor plan for this home, but changed out several details and finishes to make it wholly unique. I’m guessing that screening in the carport was a later remodel by the owners, which is cool. 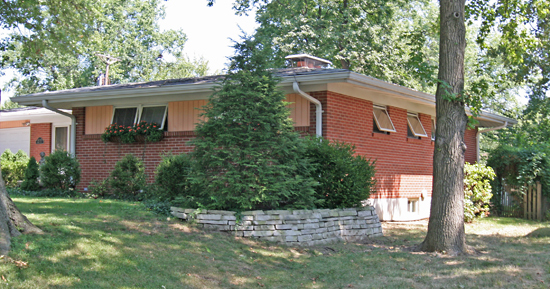 Several of the homes have turned the carport into a garage, which is a standard renovation. But it’s astounding how many of the original carports remain in tact. And we pause from all this atomic age fabulosity for the Smith Sturdy Cemetery. 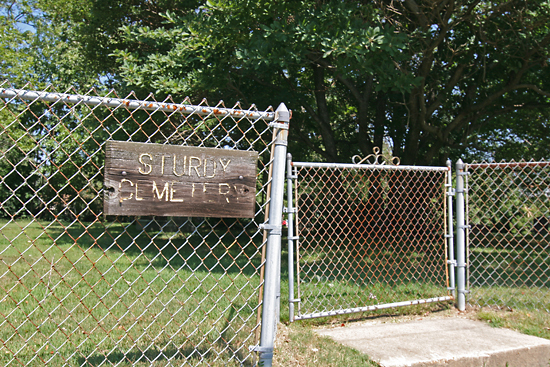 On East Watson, between Gayle Avenue and Fox Park Drive, this tiny little burial ground with, maybe, 50 tombstones, just pops out of nowhere. It’s both disconcerting and intriguing, and because I can find no solid background information, it remains a mystery. There’s a sub-species of homes in this neighborhood that fascinate me because they have no traditional front door. The designers and/or developers just dispensed with such a quaint notion, and planted a chimney where a front door should be. 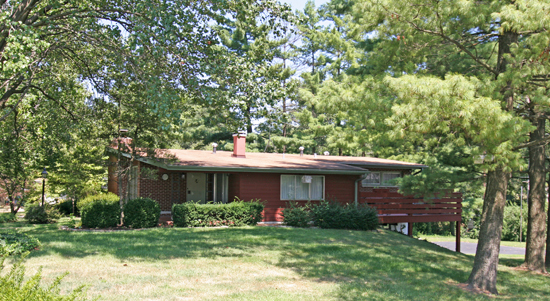 And here’s another example of how the main entrance to the home is under the carport. Which underscores the new informality that was middle America in the middle of the 20th century; it was perfectly OK for your guests to squeeze between the cars and the house to knock on the door. Think about how many times you’ve been to someone’s house where they leave the overhead garage door open so you can come through the door that leads into the kitchen, rather than the formal front door. Well, with a house like this, you don’t even have to go through the trouble of opening a garage door and exposing all your junk to the world. It just is! And because of this odd entrance situation, this may be why so many of the homes similar to this one leave the carport intact, because how else would you get in without going into the backyard? This home highlights what happens if you decide to mess with the basic floorplan and close up that carport. Follow the fascia line to the right of the chimney and you can tell they added on this covered porch around a new front (well, side entrance, actually) entrance. But the driveway still leads up to what was the carport… so how do they get into their house when they get out of the car? 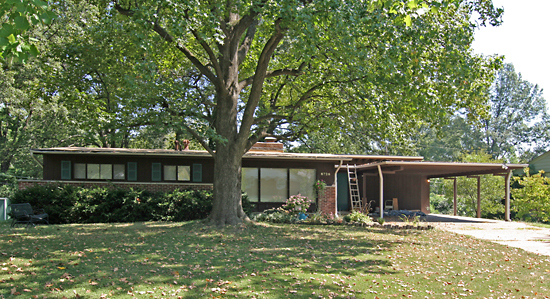 Every other house in Crestwood Hills is a fairly standard sturdy brick ranch home, which was rather clever of the developers; might as well appeal to the traditional as well as the pioneering and recoup the building money as quickly as possible. But even with a ranch as traditional as this one, above, they throw in a few modern details that lets it blend nicely with the more adventurous homes around it. 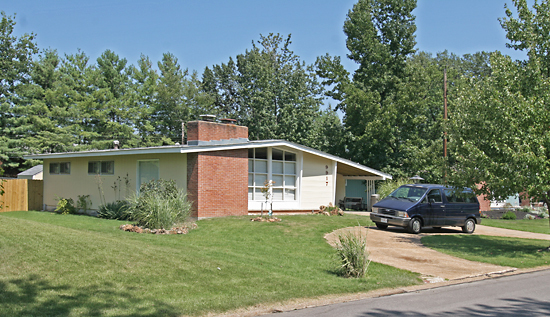 Crestwood was once a boom town, increasing its population from 1,645 to more than 11,000 people between 1950 and 1960. They couldn’t build ’em faster than the folks were moving in, but they tried. This neighborhood went up in 2 years, and I admire the richness of variety and detail that went into such a hasty project. Of interest is that the more traditional homes tend to have basements (above), while the decidedly modern homes are slab on grade. Though sometimes an unassuming brick and vinyl will also be slab on grade. What made them decide to change it up like that? This makes me think they’re may have been more than one developer/builder mining this neighborhood. 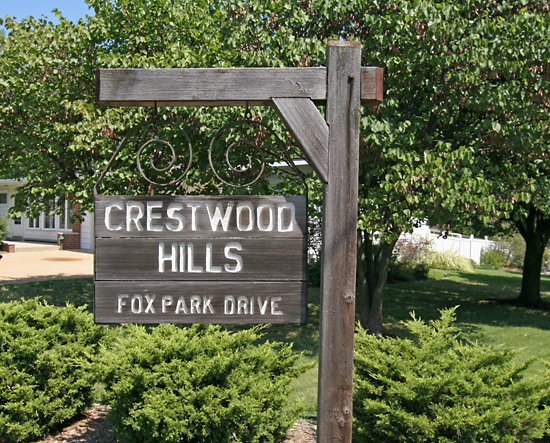 If anyone has any background information on Crestwood Hills, please please fill us in! Remember the house above that walled in its carport and created a porch on the other side? This is what it most likely looked like before the extensive remodel. And I love how they created a semi-circular drive in the front lawn, an ingenious way to get more cars onto the property while also adding a nice new bit of geometry to the overall look. Look at the generous screened porch on this one! 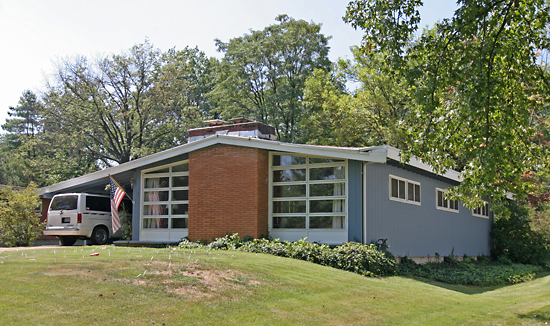 And how the semi-open porch and the completely open car port are embraced by the sweeping roofline. 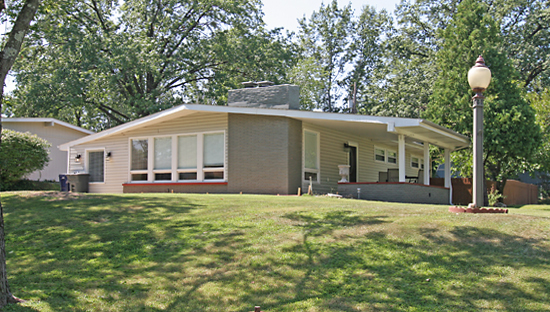 This 1957 home is 1,344 square feet, but it looks so much larger because of the fine balance of indoors and out. The square footage of all these homes range from roughly 1,200 to 1,500. 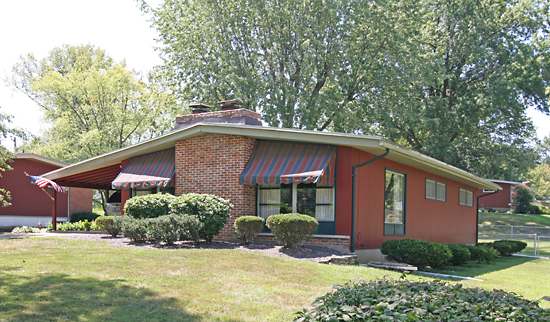 Back then, for a family moving from the city, it was a step up in elbow room. Somewhere in the 80s and 90s, it was considered too small. But a little over 50 years later, living in under 2,000 s.f. makes all kinds of sense if you want to pay your utility bills and eat. We’re struggling through a Great Recession, but I call it The Great Reset; we were living too large on money we didn’t really have, but the meter’s been reset and, out of necessity, we’re cycling back down into a more modest and humane way of living. And that’s why homes like these – when they’ve managed to survive unscathed by teardowns – become a great asset: we can afford to live in them and they’re beautiful and well-built. Try getting all 3 things like that in a just-add-water cul-de-sac village in the exurbs! 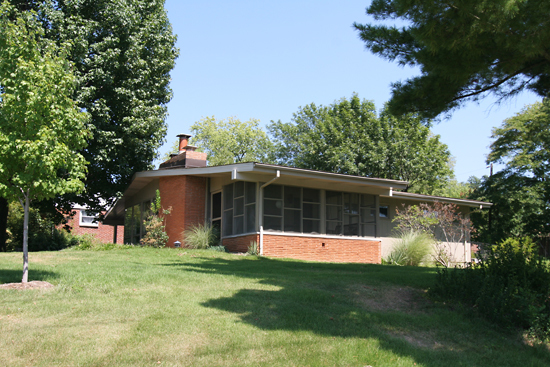 At 1,924 s.f., this appears to be the largest home in Crestwood Hills, and also the most dramatically modern. 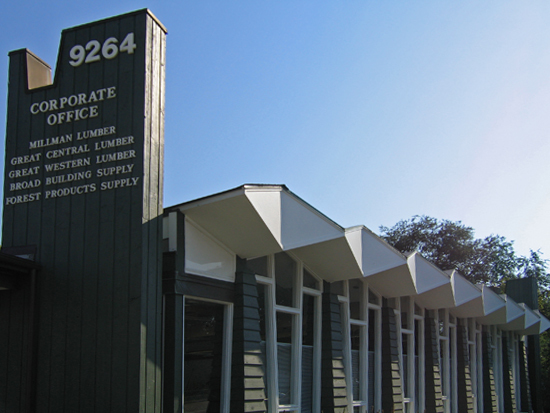 Look at those Neutra-esque bent columns holding up the carport! 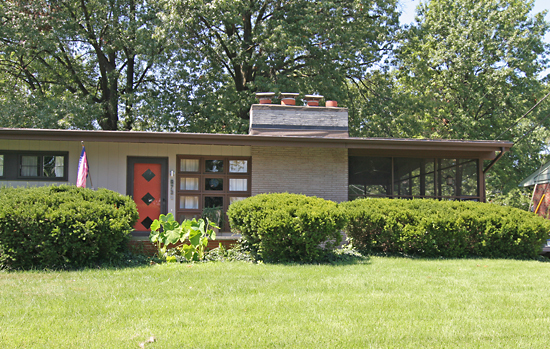 So cool that it (almost) distracts one from the hideous shutters someone slapped onto the home in later years. The homes in this neighborhood remain so basically intact 50+ years on that it melts my heart. How did they mange this? Is it because of the wide range of styles? Or that it remained such a stable neighborhood for so many decades? I really need to know! 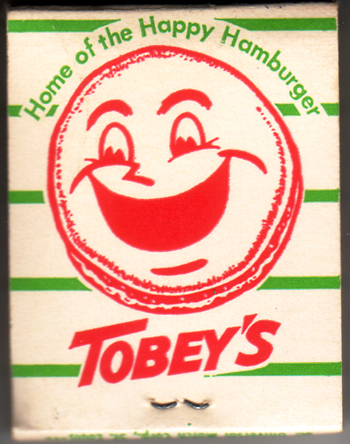 So, again, if any of you grew up in this neighborhood or know anything about it, please share some details.